Available for direct purchase, Sanchem’s SafeGard® CC’s are the chromium free aluminum surface treatments that leave an electrically conductive clear or gold protective film on both wrought aluminum and aluminum castings. This corrosion resistant conversion coating has excellent adhesion with paints, powder coatings and adhesives. 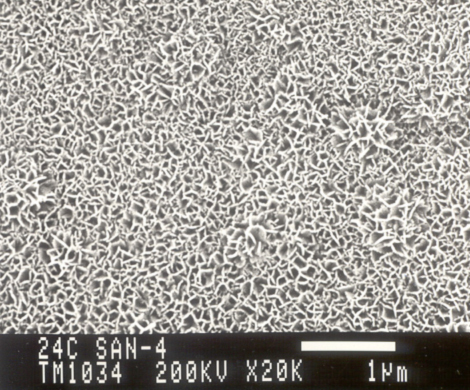 Electrically conductive - This is a reaction (at the molecular level) with a surface not a barrier coating; therefore it adds little weight to surface. What does that mean to you? SafeGard CC prevents natural surface oxidation from forming which is what reduces conductivity. 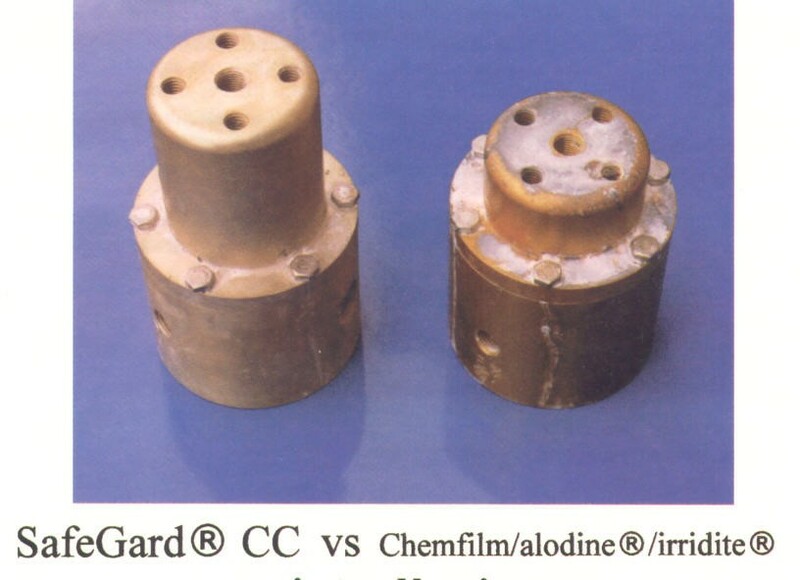 SafeGard CC maintains conductivity longer because it is a corrosion resistant coating. Many companies supplying electrical and automotive parts to Europe are using the golden color SafeGard CC aluminum surface treatment to meet Europe's RoHS Directive for use on Electrical and Electronic Equipment. Some other want a colorless surface(clear) that is RoHS compliant and they are using SafeGard CC-3400 with SafeGard CC-3400seal#2 aluminum surface treatment to achieve both corrosion resistance and maintain electrical conductivity on their aluminum parts. 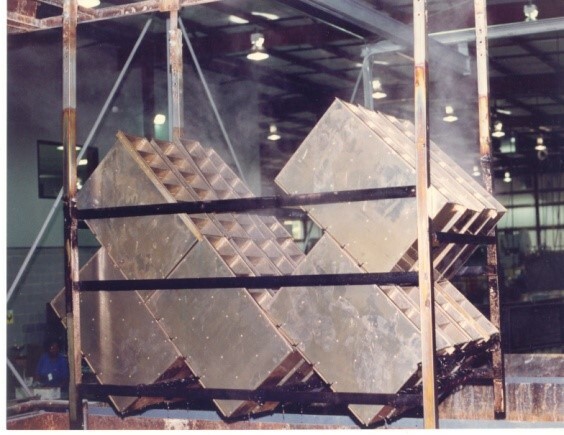 SafeGard CC chemical corrosion resistant conversion coating has been tested following the performance requirements for Mil-C-5541 by Boeing in St Louis, Missouri. Their conclusion was that this aluminum surface treatment passes both the corrosion and electrical conductivity requirements for Mil-C-5541. Why you should want an aluminum surface treatment that has color from a surface reaction? For painted parts you can use visual identification (inspection criteria for film quality) to see that the surface has been properly treated. If there are areas of no color then you can touch up those areas. This will help you to prevent areas that may have corroded or if painted yielded paint failure in the past. For colorless product inspection would be done with a testing solution which means you cannot cost effectively inspect every part if clear. Clear protective coating can also be obtained with SafeGard CC-3400. Electrically conductive - passes the requirement of Mil-C-5541 for electrical contact resistance for a class 3 coating. Perfect for e-coat! Use your current equipment with little or no modification. Excellent corrosion resistance and paint adhesion. Painting can be done either immediately after application or up to 6 months later. Excellent paint base - SafeGard CC-3400 is QUALICOAT Approved for painting architectural aluminum. Perfect for high temperature applications - product does not breakdown or emit toxic vapors or when heated. 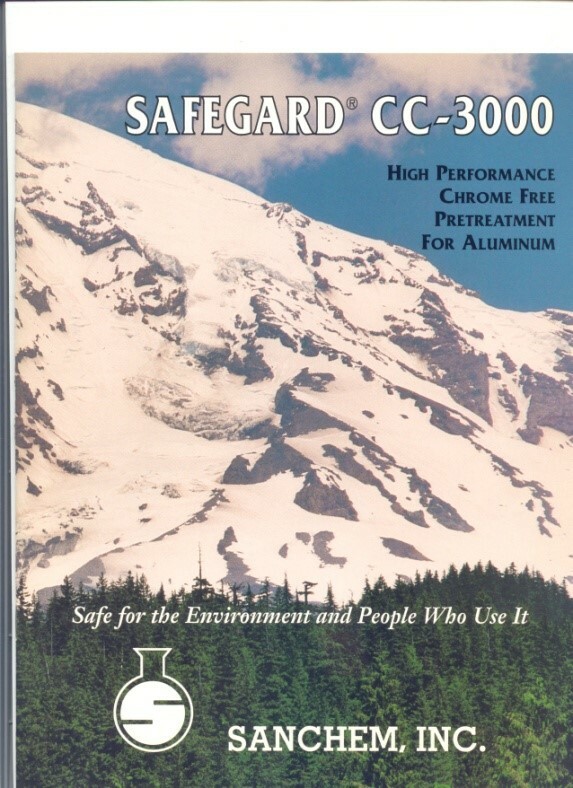 RoHS Compliant - SafeGard CC-3400: Chromium Free- Note: Trivalent chromium products can re-oxidize back into a toxic waste, non-compliant hexavalent chromate is presence of oxidizers such as air! Economics #1 - Lower maintenance costs(cleaning tank line, disposing of waste from tank cleaning) lower Quality control costs- stable product does not require testing as often, economical for initial tank filling, and longer lasting tank. What does that mean to you? Lower cost of operation more profit and less problems. Economics #2 - one gallon of SafeGard CC-3400 concentrate can treat up to 10,000 ft2 of aluminum! SafeGard CC- 4100 - Dry in place aluminum surface treatment to prevent aluminum corrosion due to humidity. SafeGard CC-6100 - Cold applied conversion coatings react in a few seconds to give gold-brown coating with excellent paint adhesion and corrosion resistance. Excellent for touch-up for field applications - SafeGard CC-6100 is designed to be able to easily touch up areas where paint has been scratched or welded and weldmounts. SafeGard CC-3000 - This chromate free aluminum oxide coating has also been used as a cost effective replacement for light anodizing for both paint, powder coating, adhesive applications and is RoHS compliant. SafeGard CC-3000 surface treatment has been used effectively with paint and coatings that often have adhesion problems such as: Teflon coatings, high performance high temperature high solids paints, powder coatings, water based and solvent based paints and high strength and thermal adhesives. SafeGard CC-3500 - This RoHS compliant aluminum surface treatment will give you a gold-brown surface in 30-40 seconds. 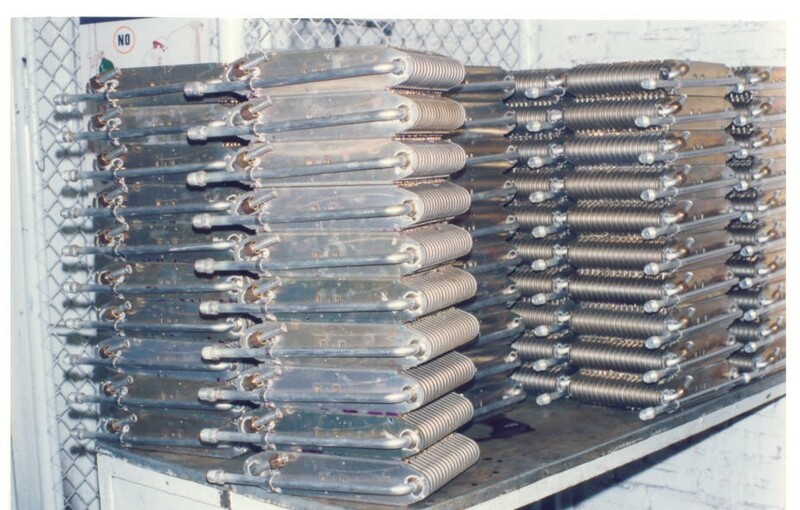 Provides excellent corrosion resistance and paint adhesion. 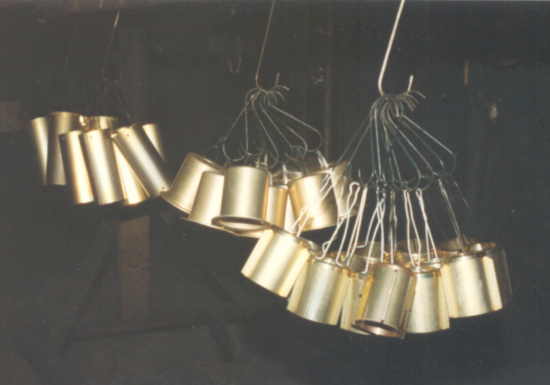 Used extensively when surface finishing with powder coating applications. RoHS compliant? - Contains no toxic chromate, trivalent chromium, cyanide or fluoride. Note: trivalent chromium conversion coatings can oxidize in air and turn back to chromates on your parts! The easiest way to increase paints performance is to use a better pretreatment. All paint systems eventually fail, however premature paint failure is normally do to poor surface preparation, poor application (low film build) or improper paint selection. The easiest and least expensive way to increase a paints performance is to use a better pretreatment.